What a year! In 2018 we had some great firsts. We rented DVC points for the first time, visited Tokyo Disney Resort, and finally stayed at an All-Star Resort! We’ve got some great plans for 2019, but we want to make sure everyone has some resolutions within reach. So here are 19 Disney and Travel Hacking resolutions for 2019! 19 Disney and Travel Hacking Resolutions for 2019! We'll start with saving at Disney before switching to credit cards and points. Then we'll give you some suggested Disney experiences to try before closing with some tips on taking your travel to a new level! Avoid the trap of booking the same vacation the same way you always have this year. By thinking just a little out of the box, you can save hundreds, even thousands, on your Disney vacation. Let's start with an easy one - buy tickets at a discount from an authorized Disney seller. We recommend comparing prices and offerings at Undercover Tourist and Get Away Today for Disneyland. For more depth, check out our post on getting the best discount on your Disney tickets. We’ve used Airbnb for Disneyland and Walt Disney World trips, and it has some huge advantages, the biggest two being price and the full kitchen. Near Disneyland, it’s easy to find Airbnbs that are walkable to the parks. At Walt Disney World, we enjoyed a stay that was an $8 Uber ride from Animal Kingdom. Referral Links: Earn $40 off your first Airbnb stay and Earn $5 off your first four Uber rides! If the Grand Floridian is a wealthy older couple in a horse drawn carriage riding down Fifth Avenue, the value resorts are a family of five hanging off a motorbike zipping through the streets of Bangkok. This isn't Disney life at its most elegant, but it might be Disney life at its best. Value resorts are a great way to save at Walt Disney World! We’ve stayed at Art of Animation, Pop Century, and All-Star Music. So far, we have no complaints, and we’re planning to continue to mix value resorts into our hotel rotation. Our first DVC rental was in 2018, when we stayed at Aulani, A Disney Resort & Spa! The most open of open secrets about how to save on deluxe stays at Disney is to rent Disney Vacation Club points or to purchase dedicated Disney Vacation Club reservations. You don’t need to be a Disney Vacation Club member to use this trick for saving big at deluxe hotels! We recommend David's Vacation Club Rentals for renting Disney Vacation Club points. This one is still on our bucket list, and we include it here because it’s a way off-beat, creative idea. If you’re looking to save on food, one good strategy is to get groceries delivered to your Disney World hotel. Disney Tourist Blog covers this subject well. Obviously your mileage will vary. I wouldn’t want to have groceries for six people over a week sitting around a small room and mini-fridge at a value resort. But if you had a smaller party, or only bought for a few days, or had a stay in a vacation club villa, you can make this work. Our Disney Resolutions Continue Below at #10. But we promised travel hacking, too! Next up, Cards & Points. This is the bread and butter of travel hacking. If you decide this isn't the year for you to travel hack, don't fret! We have plenty of other tips on saving (read on). And anyways, if this isn't the year, you should still start preparing for next year! We’ve reviewed the Chase Disney Visa card here. We’ve discussed the Chase Sapphire Preferred here and reviewed its big sister, the Chase Sapphire Reserve here. The Chase Sapphire Reserve is a great card, and you in our opinion any serious traveler should hold either it or the Chase Sapphire Preferred. The Citi Prestige's 4th Night Free benefit (which will be limited to two uses per year going forward) is our favorite credit card perk for Disney travelers. To make use of those account, follow some prominent travel bloggers. Yes, we’re pretty good, but we don’t post nearly as much travel hacking content as sites like God Save The Points, One Mile At A Time, or View From The Wing. There's so much more to Disney than the standard 4-day / 4-park trip to Walt Disney World! Make this year the year you try something new! Disneyland Paris is the easiest one if you're new to international travel. It's a fantastic destination, with our favorite Disney castle. Tokyo Disney Resort is definitely the best of the international resorts, though. And of course Hong Kong Disneyland and Shanghai Disneyland are worthy of visits too! 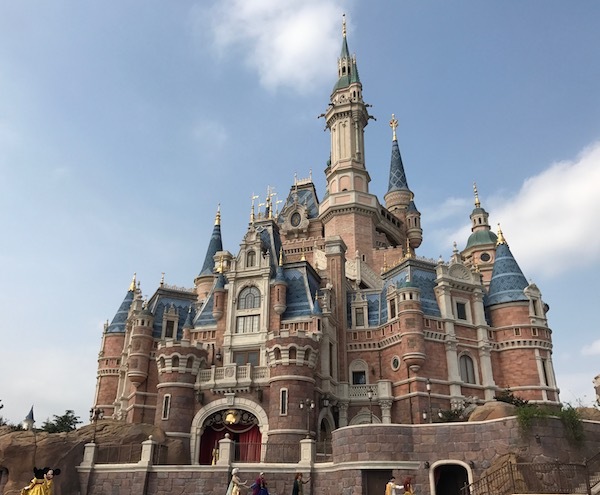 Shanghai Disneyland's Storybook Castle is the largest Disney castle! And if international travel isn’t for you, consider a visit to Aulani, A Disney Resort & Spa. You won’t find any parks there, but you will have the chance to experience Disney’s best resort. RunDisney is a unique way to combine fitness with Disney magic. These are races unlike any others, as they offer the opportunity to run through Disney parks and take photos with your favorite characters, including some you won't find any other time. Check out the RunDisney home page and scope out some races. If you can’t make any this year, that’s fine! Start training for next year. As for us, you’ll see us at the 2019 Dopey Challenge! This is on the pricier end of suggestions, and it’s more “bucket list” than “must do,” but you should at least consider a stay club level at a Disney resort. We’ve stayed Club Level a few times, and we’ve reviewed the Regatta Club at Yacht Club and Animal Kingdom Lodge’s Kilimanjaro Club Level. Club level at Animal Kingdom Lodge was one of our favorite Disney experiences, and we’ll actually be back in January. Best of all. Animal Kingdom Lodge’s Club Level isn’t a huge price jump from the Savannah View rooms, coming in near $100 most nights. That might seem like a lot, but with a large party willing to subsist on club level snacks, it will definitely be worth it. Our review of the Magic Kingdom Keys to the Kingdom Tour was one of our most popular posts this year, and with good reason. Keys to the Kingdom is a great tour and an awesome way to experience a new side of Disney World while learning a bunch of great information along the way. Mouse Hacking Tip: Pay for your tour with a Chase Disney Visa card to save 15%! Done Keys already or just more interested in something else? There are plenty of cool tours. Lisa in Wonderland has a great review of the Caring For Giants Elephants Tour at Animal Kingdom. This could be filed under saving at Disney as well, but yes, some of us actually plan a day away from the parks just for the fun of it! Spend an afternoon at Fantasia Gardens on your resort day! There is so much in Disney World outside the parks, from the Boardwalk, to Disney Springs, to Trader Sam's, to Fantasia Gardens. Take a Walt Disney World resort day to see something different! Make this year the year your fingers get exhausted from doing the "tap and grab" on your My Disney Experience app all day long. Stop settling for three short lines and five other hour-long waits. Our Walt Disney World Fastpass+ strategy is a good place to start learning how to get the most rides in at Walt Disney World. Disney debuted its Uber competitor, “Minnie Vans” for good reason—Uber is great for getting around Walt Disney World. Most rides around property are under $20, and you can easily shave an hour off your transit time. We mainly use it for getting between hard-to-access resorts, but it can always be a good way to shave time when park hopping. If you're visiting a Disney park this year, chances are your trip will start with a flight. We can only make getting from point A to point B at 35,000 feet so bearable, but hopefully with these resolutions you'll either have a better time or at least save some money (so you can spend it on Sanaa's bread service instead). Don't go booking award flights just because they're on this list, but at least see if they make sense. With your signup bonus from the Chase Sapphire Preferred, for example, you could book two round-trip economy trips on United within the United States. Alternatively, you could get an airline co-branded card that earns airline miles directly and use those to save on flights. If you're going to an international Disney park, you'll definitely want to consider an award flight to fly business or first class at least one leg of your trip. Suggested Reading: We have posts on flying business class to Disneyland Paris and Shanghai Disneyland (or anywhere in Asia) using points. When we made this a goal of ours, we took a nine-day trip to Europe out of one small JanSport backpack each. You don't have to go that far, but cutting down your packing can help you get big savings by flying low cost airlines (or basic economy). We're fans of low-cost travel, and we've got tips to help you survive low cost airlines, too. Lounges are not just for frequent flyers!! There are plenty of ways to get airport lounge access, including just dropping the money for a day pass (not that we'd advise that). We have membership to the Priority Pass lounge group through several credit cards. You can also get lounge memberships through the Citi AAdvantage Executive World Elite Mastercard and the United MileagePlus Club Card. TSA PreCheck is a great way to get you (and kids under 13) through airport security in the U.S. faster and with less hassle. Global Entry is a program that comes with TSA PreCheck and additionally allows you to get through customs and immigration in an expedited fashion when entering the U.S. Last time we entered the U.S. at Newark, the lines look like they easily totaled an hour of waiting. Mouse Hacking Tip: Several premium credit cards reimburse the cost of a TSA PreCheck or Global Entry membership, including the Chase Sapphire Reserve, Citi Prestige, and American Express Platinum. BONUS! 20. Subscribe to Mouse Hacking! We know, we said this list was 19 because that's a nice number for 2019. But this is more of a bonus resolution (and one you can accomplish right now!). We’re only two years old, and that means we have so much more to do and to share with you. In 2019, the top of our resolutions is to continue to improve our site. That means getting you accessible, usable content so that you can travel hack and save on your way to the Disney experience of your choice. By subscribing, you not only support us (the subscription is free, but it means a ton to us when people sign up), but you'll be the first to get exclusive deals and tips. We don't spam, and you can unsubscribe at any time! Do you have any Disney or travel resolutions for 2019?